Money in Motion gives you the information you need to handle your money and credit with confidence. You'll learn about budgeting, your credit report and credit score, setting financial goals, organizing your financial records, and taking the appropriate steps when you're in financially challenging situations. By applying what you learn in Money in Motion, you'll have the skills you need to get ahead financially. Learn to develop financial goals and budget that can get results. When you set goals, you can achieve more than you thought possible. A budget based on your goals will help you spend your money carefully so you can get more of the things you want. Learn about financial tools that can help you manage your money. These tools include methods of payment that you use – such as cash, debit cards and credit cards – and also methods for saving money, such as comparison shopping. •	Learn about contracts and consumer laws and the ways they affect you. Contracts are everywhere; find out what you should know before you sign one. Money in Motion will help you become an educated consumer who knows where to find help when faced with scams and other problems. Q.) I'm in the middle of a divorce, and I've never handled the household finances before. My spouse always did that. Dealing with money and credit seems confusing and overwhelming. Could this course help me? A.) Yes. 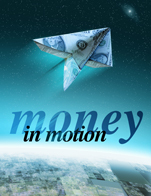 Money in Motion explains the basics of money and credit clearly and simply. This course will help you understand budgeting, your credit, and other issues you'll need to know about, such as signing contracts, consumer laws, and protecting yourself from scams and identity theft. Money in Motion gives you a good foundation for handling your finances. Q.) Is this class only for people who are having financial problems? I'm looking for a class for my son to take so he knows about dealing with credit cards before he goes off to college. A.) Many people who take the Money in Motion course tell us they enjoyed it so much wish they had taken it before they found themselves with financial problems. Money in Motion is good for adults of all ages, from older teens like your son to senior citizens. In addition to the information about credit, a section of the book about contracts, roommates and renting apartments will be very useful for your son. Q.) Does completing this class help my credit score? A.) Simply completing the class will not raise your credit score. However, by applying what you learn in the course, you'll know what you need to do go get and maintain good credit.